I want students to solve systems out of necessity. I want them to feel the interconnectedness of the two (or three) equations. In the past, I’ve asked small groups to build a functional 4×4 magic square. Soon they realize that changing a single number has multiple effects; this is the nature of the system. Unfortunately, abstracting the connections results in more than two variables. This year, I wanted to create the same feeling with only two variables. (The familiar x & y). 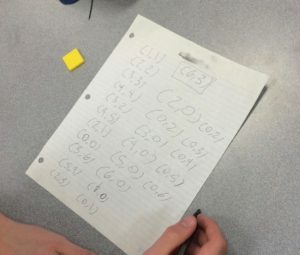 We blitzed through a task of his for systems of equations when I participated in a workshop of his last year. His blog is fantastic, because he recounts classroom events. It is filled with straightforward stimuli for the practicing teacher. His ideas have occasioned many tasks of my own. I took his post, and extended it into inequalities. Two children go into the candy store. Bob buys 3 JuJubes and 4 Smarties for 26 cents. Sally buys 2 JuJubes and 7 Smarties for 24 cents. If every JuJube costs the same and every Smartie costs the same, what is the price of both candies? They grabbed a handful of pennies and coloured tiles and got to work setting up the situation in much the same way Alex’s students did. Them: The prices. You can’t do it. There is some left over. Me: Then increase the price. Them: [adding pennies] but then this one doesn’t work. Me: Then I guess take some away to make them match. …and it would continue on. They couldn’t make a move (change a price) in isolation. This is the feeling I wanted from the system–interconnectedness. As the discussion of strategy began, the class quickly realized that no solutions existed. Some began with high prices and then punched numbers in calculators in linear combinations until they matched. 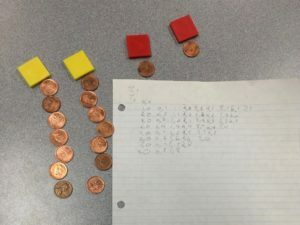 Others worked in tandem with one student calculating JuJube price and the other Smartie price. Some began with both candies being one cent, and then walked up until they reached the boundary. All contained great mathematical action, but none yielded a satisfactory answer. I then began to alter the notation. First, I defined JuJube to be “J” and Smartie to be “S“. Then re-wrote the equations. Second, I replaced “J” with “x” and “S” with “y“. Third, I numbered the equations. At this point, several “ooooooohhhh” sounds came from the class. 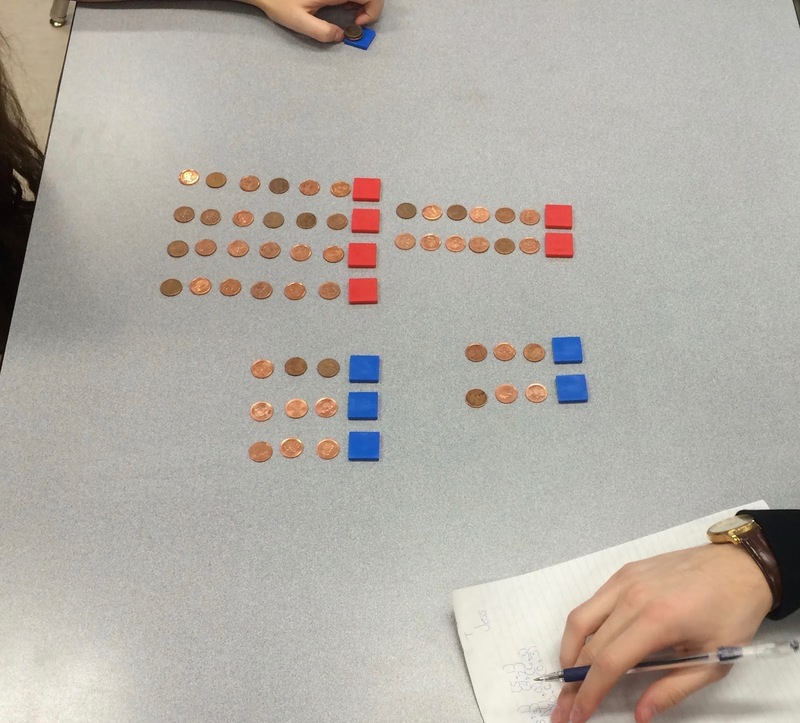 They had just finished solving systems of linear equations in grade 10. We then refreshed the vocabulary of this process and I gave them the next scenario (one with a nice solution). We ended the day talking, once again, about the interconnectedness of systems. I began the day by randomly grouping the students and placing a familiar problem on the board. 2 JuJubes and 2 Smarties cost 18 cents. 4 JuJubes and 3 Smarties cost 33 cents. How much to JuJubes and Smarties cost? 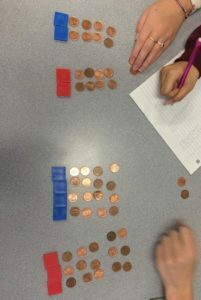 They got to work arranging their pennies and quickly arrived at a solution of (6 , 3). I then posed a new scenario. Two young gentlemen want to impress their girlfriends by giving them a dynamite Valentine’s gift. The first can spend up to 18 cents, and wants to buy his sweetheart 2 JuJubes and 2 Smarties. The second can spend up to 33 cents, and wants to get his sweetheart 4 JuJubes and 3 Smarties. What could the prices be so that both gentlemen can get their desired gifts while remaining under budget? The take up was slow until one student suggested that they steal the candy. This was a great starting point because I told them they wouldn’t have to steal them if all the candy was free. Then I asked groups to find all possibilities. I put them into a table in Desmos to show the pattern. The result was a stippling pattern on the natural number solutions. This created a natural way to talk about the different domains and ranges that the problems require. I have never had such an organic entry into stippling; I always just said those were the spots that were “allowed” because of restrictions. On the third day, we went through examples of notation and mechanics of solving the problems. It was interesting to hear how many times a student would refer to candies or pennies when explaining things to other students. My goal here is to mimic Alex’s style and provide you with a start–an actual account of how it ran in my classroom. You know your students best, and have a intuitive feel for when they need more scaffolding or higher ceilings. Take this, adapt it, and extend it further. Thanks for providing so much detail!! It really helps me picture how to recreate this with my students. I love the idea of grounding that idea of interconnectedness.